While it’s true that direct routes are by definition shorter than those that include zigs and zags, as we’ll see shortly, the difference, especially on trips of the length typically flown by piston-powered aircraft operating below the flight levels, is usually much smaller than most pilots assume. In the event, terrain, airspace, and preferred routes (under IFR) can make direct routes ill-advised, impractical, or impossible, especially in the mountainous regions of the West and within the congested airspace of areas like the Northeast, the Bay Area, and the LA Basin. It’s also far easier to amend a flight plan than it is to build a complete flight plan from scratch, and having a detailed route “in the box” before you leave the ramp also helps reduce heads-down time while taxiing and during high-workload phases of flight like departure and arrival, especially when you’re trying to navigate unfamiliar airspace. But for the purposes of this exercise, assume that direct routes are feasible. Today, many tools make laying out routes an easy, no-math proposition, so planning a flight with course changes is hardly a chore. 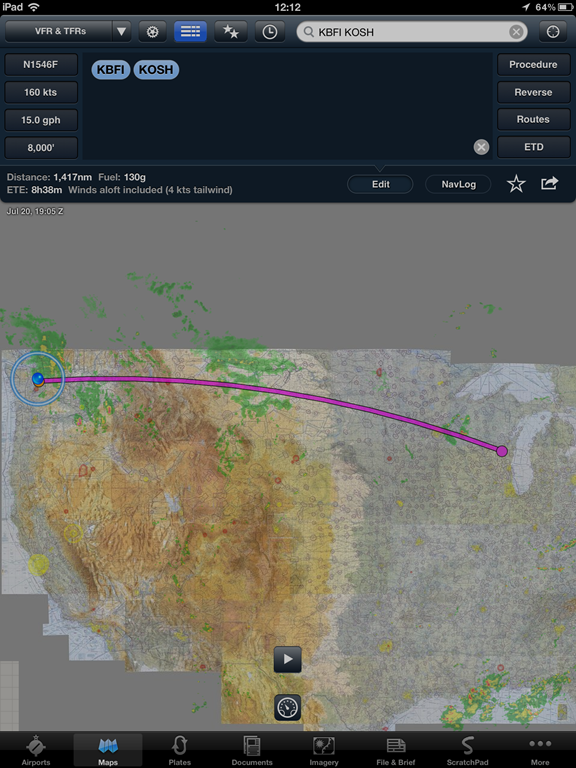 Flight-planning/navigation apps like ForeFlight (version 4.6 is described here) now include flight-planning/route-building features that make it easy to compare direct and airway routings and to include preferred and TEC routes, and SIDs and STARs. 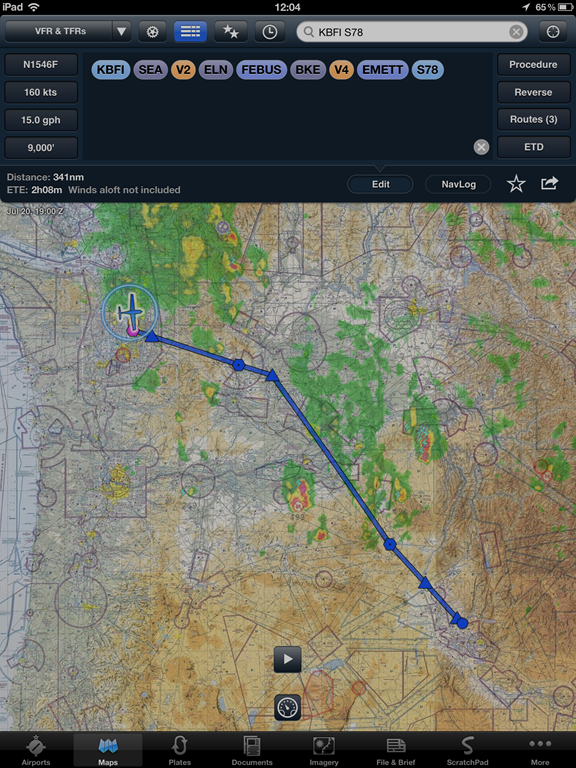 The flight log features in iPad apps like ForeFlight also help you efficiently build flight plans in GPS navigators (such as the popular Garmin GNS 400/500 series boxes) that require manual entry of at least the fixes that define entry, turn, and exit points of airways or the initial fixes of SIDs and STARs. 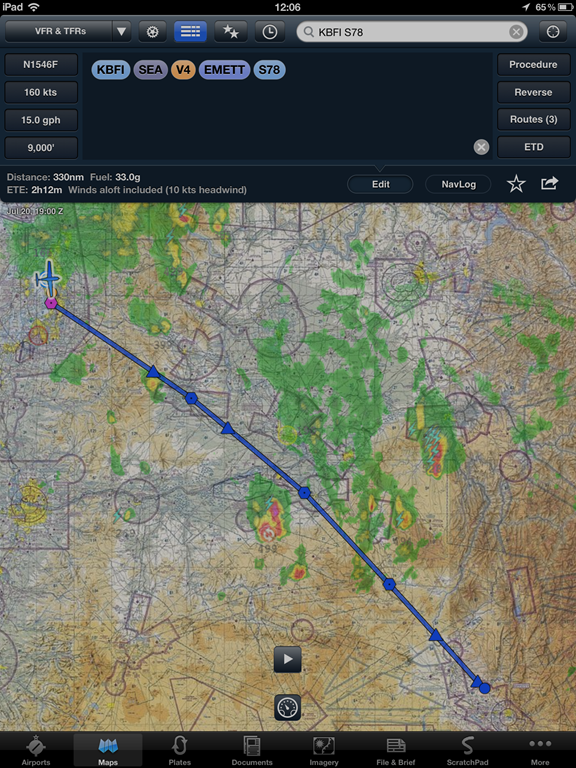 Let’s use ForeFlight to explore some of the issues outlined above in more detail. 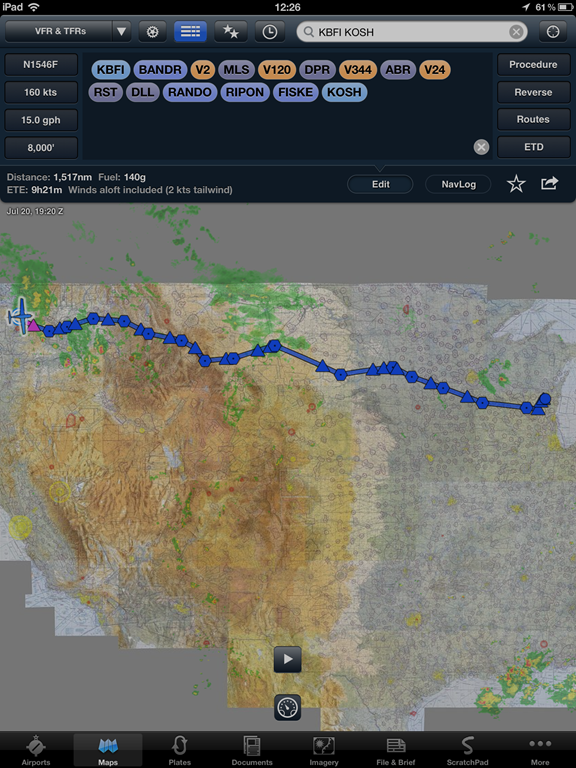 Here’s route between Seattle and Boise that I fly several times a year to support Pilots N Paws. It’s from Boeing Field (KBFI) to Emmett, ID (S78). As you can see below, the direct route is 327 nm. In this example, at 160 KTAS, estimated time in en route is 02:10, and the trip requires about 32.5 gallons of fuel, not including time and fuel to climb. And climb we must to fly this route, because under IFR we must cruise at or above 10,000 ft. to clear terrain (probably at least 11,000 ft. when flying southeast). The direct route also clips or comes close to a couple of restricted areas. My typical, mostly airways, route, at 341 nm, is only 14 nm longer, about 5 minutes at 160 knots. This route follows the airway between SEA and ELN (MEA 8000) and clears the big restricted area near YKM. In fact, the total mileage is a bit less, because after takeoff, ATC typically vectors me to join V2. The KBFI-SEA leg is in the flight plan (and the box) just to make it easier to join the airway. This route also passes near many airports and VORs, giving me options and backup navigation sources. Another common route, via V4 out of Seattle, is, at 330 nm, practically the same as the others, although it requires a cruise altitude of at least 10,000 ft. under IFR. Here’s another trip that I make a few times a year: KBFI to the Bay Area with a fuel stop (for relatively inexpensive fuel) at KOVE (Oroville, CA). The direct route is 483 nm. That route spends a lot of time over the mountains and clips some MOAs. Because of traffic between Seattle and Portland, ATC isn’t likely to offer it under IFR. My usual filed route avoids those issues and comes in at 511 nm, a difference of 28 nm (about 10 minutes at 160 knots). It clears the busy corridor between Seattle and Portland, and ATC usually accommodates it. Again, this route remains close to many airports, and the majority of the flight is over terrain that allows reasonable MEAs. Because I have stored this route (including the fixes that define V23) in my GNS530W, it’s easy to include changes or shave miles if ATC approves shortcuts (e.g., between OLM and EUG) or deviations for weather. But as we’ve seen, on trips of this length, trimming a leg or two doesn’t typically offer significant savings in time or fuel. But what about a much longer flight, say the annual trip to EAA AirVenture in Oshkosh, WI? Leaving aside the need to stop for fuel and spend the night, the direct route from KBFI to KOSH is 1,417 nm, about 08:38 of flying time at 160 KTAS. A typical, mostly airway route (subject, of course, to changes for weather) is about 100 nm (some 7 percent) longer, but it adds less than 1 hour of flying time (winds aloft and other factors being equal). Total block time, of course, would be much greater to accommodate fuel and overnight stops, but those considerations also apply to the direct route. More importantly, the mostly airways route guides you through mountain passes and keeps you relatively close to airports and highways (which means you’re also nearer towns and services). 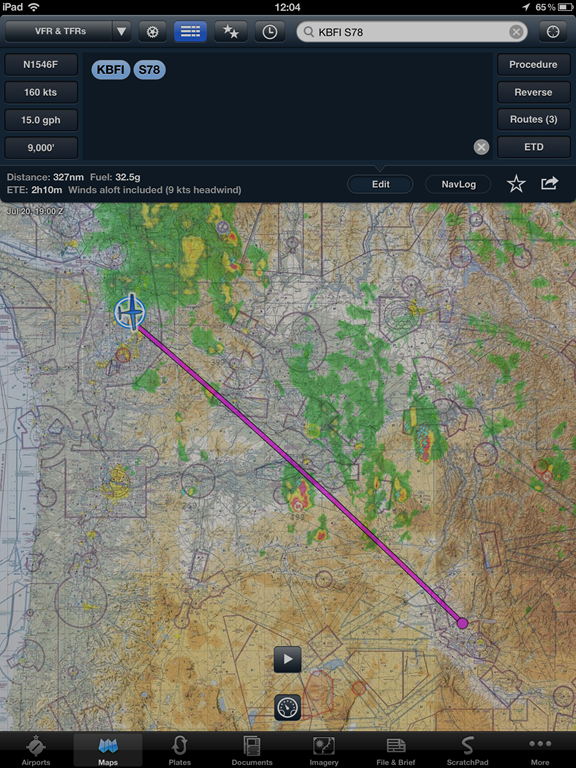 As I’ve suggested above, filing and filing a route that includes airway segments and multiple waypoints can also help you track your progress more easily than when following long direct segments. 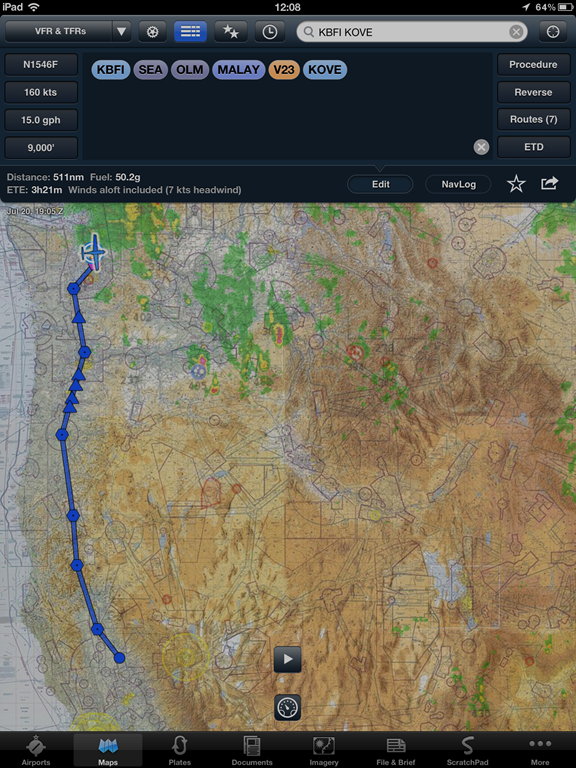 The act of laying out a route and building a flight log encourages you to become familiar with navigation fixes and to think about decision points along the way. What’s the weather like at nearby alternates? Which airports offer the best services? What types of instrument approaches are available along the way? 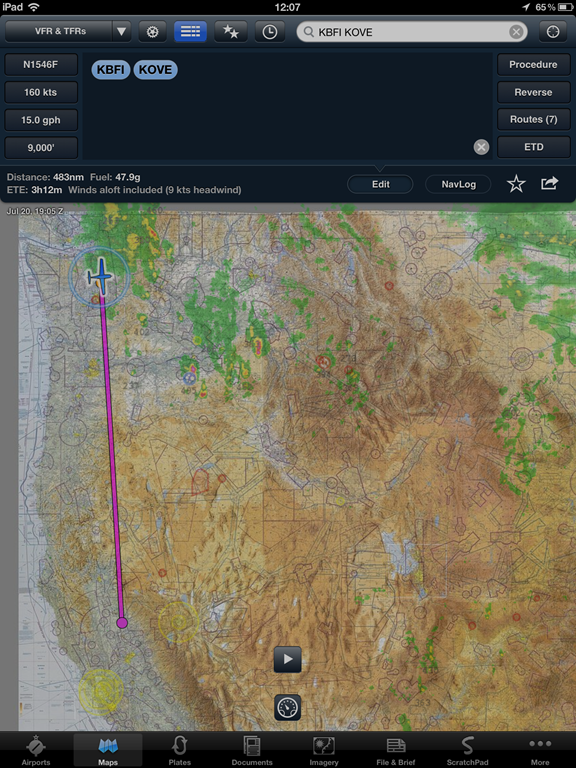 What are good points en route to evaluate your actual flight time and fuel burn? It’s certainly possible to ask and answer such questions when laying out a basic direct route, but there’s often real value—and little additional cost in time or money–in following another path.